Being a construction worker is a really hard work. It is one of the most exhausting jobs. Most workers take break at the construction sites and here we have the images of some Chinese construction workers napping at 160 feet above ground. The picture is viral for it is shocking to see men wearing safety harnesses attached to the pylon and taking a nap at such a height. The picture is equally heartbreaking as well. 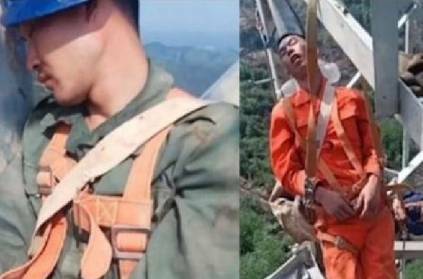 According to the South China Morning Post report, the workers, wearing full-body safety harnesses attached to the pylon, were filmed snoozing comfortably on the narrow steel bars in Chenzhou, Hunan province. "Since it's really tiring to climb up the tower, we would only climb back down to ground level for our lunch," one of the workers told SCMP. They climb up the tower and take naps. The first time is always nerve-racking, but they slowly get used to the height. This page contains news relating to various facts and events. The views are generally about current affiars and general topics in diversified areas such as political, international, national, and regional issues, sports, health, travel, lifestyle, technology and business. People having similar interets on the above topics will find this page useful. Construction workers sleep at 160 ft above ground on steel bars | World News.